Today, I wanted to write about something I think all of us struggle with at some point in our lives. The feeling of feeling worthy. Feeling deep inside — your own worthiness. So many of us struggle with our own sense of self. The world often wants to make us into something we are not, something we just can’t be. Some of us conform and live a mediocre life. We settle. We think to ourselves, that this is the only way to live. Everyone else seems to be living this way, why not us? We decide it’s just the way things are. “Why should I?” we sometimes ask ourselves. The doubts creep in. The negative thoughts we meditate on consume us. We feel ourselves even deeper in that well of darkness, wondering if there is ever going to be a way out. And then one day, we wake up. Through divine intervention or from life’s circumstance, we suddenly wake up to a new day. We look in the mirror, and suddenly realize the life we’ve always wanted is there, just waiting for us to grab it. It was there all along. We just had to open our eyes to see its magnificence. To grab hold of the opportunity. Feeling that we’re worth it all. Daring to dream for more. We all only get this one life. We really do. Some of us — me included — waste so much time trying to figure it all out. I am really thankful for my life. Every bit of it. For it’s in the trenches where I’ve learned the most. In the trenches. When I’ve been beaten down, defeated, and felt I just couldn’t go on. It’s during those moments where I’ve felt the hand of God reach down and meet me where I’m at — every time. has a specific lesson to learn. We are all living this life, on this planet. For some of us those lessons take a while to understand. My entire life up to this point has molded me into the woman I am today. The inspiring woman. The creative and colorful woman. The introspective woman. The passionate woman. Yesterday, I shared a meal with a young woman that said something that I will always remember. We were talking about being emotional, and wearing your heart on your sleeve. We were talking about being sensitive. We both agreed that society and most people think of it as something bad. A negative. We both strongly disagreed with this. We both agreed that being emotional or sensitive is a good thing. She said something that really hit home for me. Instead of calling us “emotional,” instead, call us PASSIONATE. I am passionate. Passionate. And for that I will never apologize. I want to live a passionate life. I want to feel everything. The good, the bad and the ugly parts of my life. 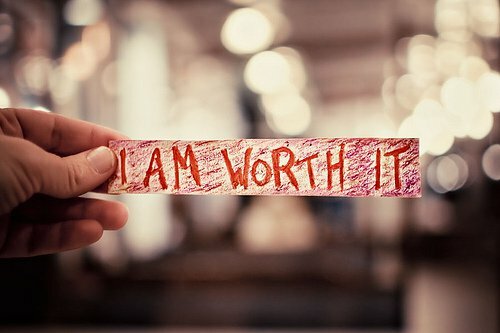 I am worth living a happy life. We all have gifts we have been given. Each one of us. We all are responsible for our own actions in this life. Every single one. Live a gracious life. Live a life filled with love and kindness. Let there be no room in your life for vicious attacks, for hurtful words, for demeaning another human being. Let us celebrate one another, instead of tearing each other down. I will get there. I will get there. Editor’s note: This post originally included more numerous religious references; with the author’s permission a handful of minor edits were made in order to be more in keeping with the Studio Mothers’ framework of inclusive secular humanism. This is so timely for me! I have the fortune of having been surrounded by supportive people during my life (for the most part), so my feelings of unworthiness stem from my own mind. It’s an exhausting and fruitless dynamic I seek to stop participating in! I find the shared experience and wisdom from other seekers (like yourself) to be immensely helpful.